In preparation for writing my own fantasy series, I’ve been working several new fantasy series that I have never read into my repertoire. The Discworld series by Terry Pratchett is the next one I have to explore. I have never read such a nonsensical conglomeration of happenstances, and I mean that in a good way. 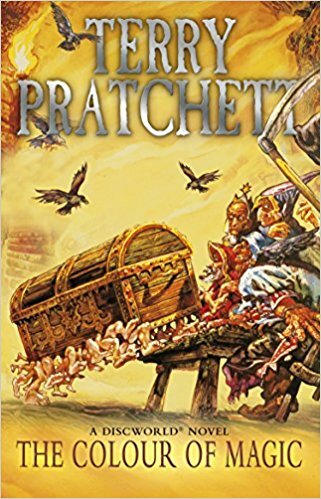 In a short 200 pages, Pratchett introduces us to a failed wizard, a strange visitor with luggage that walks and bites and a picture box run by a small imp who takes and processes pictures like a camera, and an entire city caught on fire. Death (the actual being) follows our wizard Rincewind around, just waiting for him to die and seems to be thwarted at every turn by a game of dice that the gods are playing (think Clash of the Titans) and dragons which are created out of thin air with those that wield the power of imagination. Every two paragraphs you are assaulted by some new twist or turn, placing Rincewind and Twoflower into the path of danger time and time again. It’s almost as though Pratchett just thought of the most severe non-sequitur that might follow the recently concluded action sequence and went with that. Did we just escape from an ancient demon’s underground temple maze? Why don’t we fight the dragon lords of the upside down mountain next? And never mind that all these lands exist on a spinning disc, which itself exists on the back of a giant space turtle, moving toward a big bang mating ground IN SPACE. He also allows for the possibility of multiple timelines, when in the midst of a very stressful battle, Rincewind and Twoflower are ripped from their own world into a TWA flight where they have similar but different names that we might find in our own Earth, before their consciousnesses are pulled back into the Discworld. You won’t have time to get bored in this fast-paced, wild-eyed, story of wonder that tests your imagination at every turn. When you’re done you’ll even believe it’s possible to will a dragon into being out of thin air. Go get you some, and I’m gonna get me the next one!